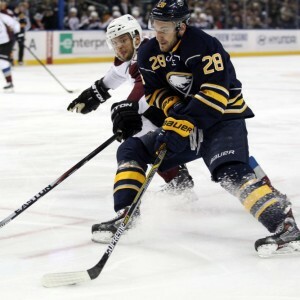 As the end of July approaches, Zemgus Girgensons remains as one of the two Buffalo Sabres restricted free agents who have yet to sign a new contract. 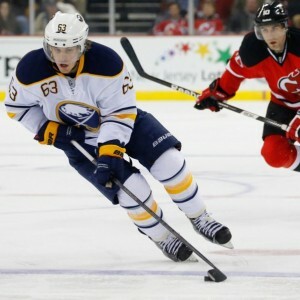 The other, Rasmus Ristolainen, will certainly be signed to a long-term contract over the next few weeks. In Girgensons’ case, the questions continue to follow the former first round pick. Is he part of the long-term plan in Buffalo? Do the Sabres still have a fit for him on the roster? Girgensons was moved all over the roster last season under the first season of Dan Bylsma. The Latvian native played top-six minutes and bottom-six minutes. He was given the opportunity to play on the wing with Jack Eichel and at times found himself on a line with Matt Moulson at the bottom of the lineup. Girgensons spent the most time throughout the season playing on the wing with Sam Reinhart and Eichel (8.19 percent), according to leftwinglock.com. The next highest frequented linemates were Brian Gionta, Johan Larsson and Matt Moulson at a combined 14.2 percent frequency. The 2012 14th overall pick was shuffled throughout the lineup playing on the wing and at center. Bylsma never seemed to find a spot that he felt worked well for Girgensons. This raised the questions if the Sabres know what they want to do with him or even have a spot for him on the roster. Girgensons indicated that his desire was to play center and that may be the spot for the 22-year-old. Playing as the top-line center in the 2014-15 season, Girgensons, was an All-Star, scoring 15 goals and 15 points in 61 games. He was on pace for a 20-goal and 40-point season before an ankle injury cut his season short. Coming off of that season, the expectations were high for Girgensons, but he disappointed last season, only scoring seven goals and 18 points in 71 games. Again, injuries were part of the story and his role was far different from the prior season. Girgensons actually ended up averaging less time on ice last season than in his rookie season. If Girgensons does indeed re-sign with the Sabres, it’ll likely be on a short-term, one- or two-year contract. A short-term deal makes sense for both sides. Buffalo can further evaluate where he fits on the roster. On the flip side, Girgensons can invest in himself and have a bounce-back season that could propel him into a larger contract. Evaluating the roster as currently constructed, Girgensons appears to best fit a third line role with the club. Most of the more successful NHL teams are moving into the top-nine mold of building their forward lineup. The Stanley Cup champion Pittsburgh Penguins are a perfect example of a top-nine lineup. In a scenario where Jimmy Vesey signs with Buffalo, he can fill a top-six role along with Ryan O’Reilly, Kyle Okposo, Evander Kane, Eichel and Reinhart. This would allow the Sabres to ice a potentially very speedy and dangerous third line with Girgensons in the middle. On his wing would be Tyler Ennis, who he previously had success playing with two season ago. On the other wing could be 21-year-old Justin Bailey. That trio would provide a dangerous combination of size, speed and skill. The third line center role won’t simply be handed to Girgensons on opening night. He’ll need to come in and compete with Johan Larsson in training camp. The trio of Larsson, Gionta and Marcus Foligno ended the season very strong for the Sabres. Bylsma would likely want to keep that group together. If Girgensons can earn that third line role, it would allow Buffalo to become an even deeper club with the Larsson line now falling down to the fourth unit. There’s absolutely a spot on the roster for Girgensons this season and in the long-term. He’s the type of player that fits into a bottom-six depth role. Those type of players are vitally important if the Sabres have desires of being a Stanley Cup contender in the next few years. The coaching staff needs to commit to finding a consistent role for Girgensons, which would allow him to be successful. The constant line juggling makes it difficult for any player to feel comfortable and understand their responsibility on the roster. This late into the offseason, it’s becoming more unlikely that Girgensons would be moved out in a trade. Big moves are rarely made this late into summer. However, with that being said, if the right deal does come about, the Sabres should not shy away from using Girgensons as a trade asset.